A training checklist to help you make sure you're doing everything you can to run faster and improve your running endurance. The ability to run fast takes practice running your fastest, and the capacity to run farther requires practice running long distances regularly. Experts recommend increasing one variable in your weekly running no more than 10 percent. Variables include, but aren't limited to, shoes, terrain, cross training, frequency, duration and intensity of your running and training. Running frequency depends on the runner. Elite runners run as often as 14 times per week, or twice per day every day. Beginners can make progress running as little as three times a week. A beginner who wants to run faster and longer can safely and successfully do so by consistently running three times a week with a day of cross training between runs. The more advanced the runner, the more specific his or her training has to be to improve their running. Regardless of his or her level and training status, the runner should always plan and progress intelligently while listening to his or her body. The only way to run faster is to increase your foot speed, cadence/strides per minute, and/or stride length. However, increasing your stride length too much will increase the impact on your body and raise the likelihood of sustaining an injury. 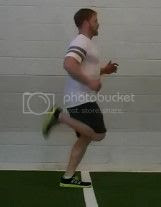 To find the right stride length for you, make sure your front foot does not reach out past your front knee. You should be able to take 180 steps or more per minute. One way to make sure you are getting at least 180 steps per minute is to run to the beat of the song "Turning Japanese" (see video below). Nick Outlaw - With over 13,000 hours of coaching and training experience, Nick Outlaw, CPT, CSCS, CES, has helped hundreds of clients, including athletes of all levels. For more information and to see sample sandbag and barbell workout templates, visit his website at OutlawFit.com.